Chances are you have seen one of these shows: Ghost Hunters, Paranormal State, Ghost Adventures, Extreme Paranormal and even Psychic Kids. They all have something in common besides chasing ghosts. They are have used KII EMF Meters. After one very intense episode of Ghost Adventures, I figured I would try to find a KII EMF Meter. It turns out that they are real and available for sale. 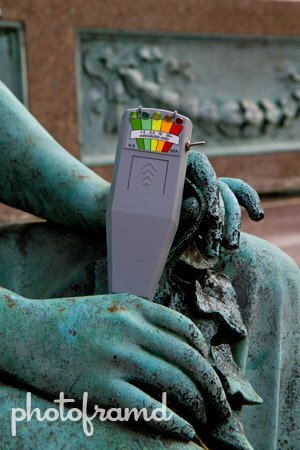 A KII Meter samples Electromagnetic field (EMF) in a very visual way. These shows have used this meter to have a “discussion” with a paranormal entity. Now, the piece that is not always discussed. By lightly pressing the big grey button on the front of the meter, you can create fake readings and light the thing up. There is a great YouTube video that shows how to fake such readings. The solution is to modify the unit with a side switch to disable the grey button and put the unit into a constant on or off state. You can see the switch on the right-side of the unit in this photo. These modified KII Meters were originally offered by a paranormal investigation group in Florida called GhoSt Augustine. This group supplied both Ghost Hunters and Ghost Hunters International with their KII Meters and have even appears on their TV shows. GhoSt Augustine now offers a new unit from the same manufacturer which is manufactured with a constant on/off switch, eliminating the need to modify the unit. So, if you want to play Ghost Hunter, pick this meter up and have some fun.